Grace & Favour, the innuendo-laden BBC TV classic and spin-off to Are You Being Served? from comedy-writer legends David Croft and Jeremy Lloyd, is being released on DVD for the first time in UK from 23rd May 2016. The sequel series to one of the most beloved British sitcoms of all time, Grace & Favour (released internationally as Are You Being Served? Again!) reunites the dysfunctional Grace Brothers sales team for more misadventures and innuendo-laden squabbling. After “Young Mr. Grace” dies in an unfortunate scuba-diving incident, the staff at Grace Brothers find that their pension fund has been unwisely invested in a country manor house, currently operating as a hotel. With no other options, Mr. Humphries, Mrs. Slocombe, Captain Peacock, Miss Brahms and Mr. Rumbold all reluctantly team up and attempt to turn the hotel into a profitable business venture. Reuniting the original cast members from Are You Being Served! and written & produced by British comedy-writer legends David Croft and Jeremy Lloyd, Grace & Favour is one of the finest sitcoms ever produced for British television. Presented here in a new four-disc set, this long overdue home entertainment première is full of more laughs and double-entendres than you can shake a stick at. 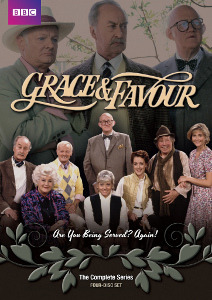 Grace & Favour is released on DVD on 23rd May 2016 courtesy of Eureka Entertainment. The competition closes at 23.59 (GMT) on Sunday 29th May 2016.